An FM Transmitter is a very easy and efficient way of listening to music stored in your MP3 player through a normal FM radio, music system at home, and music systems in the car. However, to someone who is new to FM transmitters there are several questions like how the system works and how do you use it. In this short article, let’s see what makes these awesome devices work. First, a technical insight into how does an FM transmitter work; the transmitters have a built-in converter that receives the audio input from any external source and then converts this data into an analogue audio signal. After that, there is an FM Modulation feature in transmitters that takes these analogue signals and converts them yet again into FM signals. Once this is done, all you do is tune the radio frequency to catch these FM signals and listen to music. To a normal user, an FM transmitter is just a device you plug into an MP3 player and listen to music on a radio at home or in a car. In that respect, FM Transmitters are very simple to use. Simply use a cable to plug your FM Transmitter into the headphone jack of your MP3 player. Most transmitters come with these cables. If not, you can buy them really cheap at any store that sells MP3 players. It is similar to a headphone cable but instead of headphones at either ends, it has a 3mm connector. 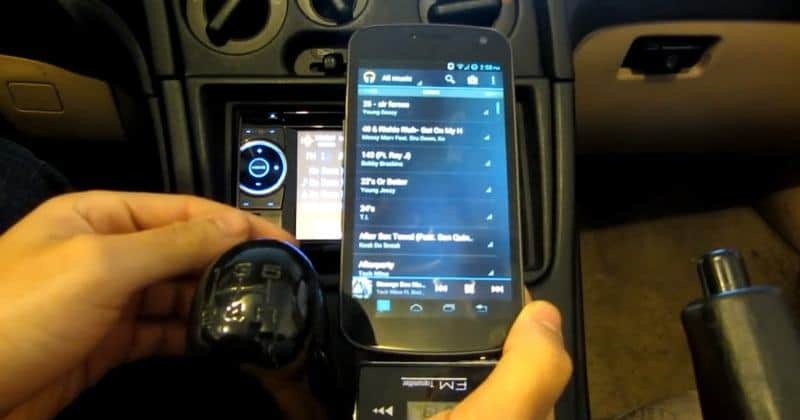 Once you’ve connected the FM Transmitter to the player, turn on the transmitter. Tune it to a frequency that is available for use. You will know a frequency is available for use when the radio plays static at a particular frequency. You will find many such channels. It doesn’t matter which one you choose in particular. Now play some music from your player. Once the music is playing, tune in your radio as well to the same frequency as your transmitter and the radio will start playing the music. An important point to note here is that you are broadcasting this music. Even though the range of signal travel isn’t that great, anyone within a distance of 100 feet or so can listen to your broadcast in that range. Also, the signal strength is fairly weak and can be distorted by stronger radio waves of other radio stations. That apart, FM transmitters are a great way to enjoy music at home or on the go. We've create a buyer's guide that will tell you everything you need to know to buy the perfect FM transmitter.